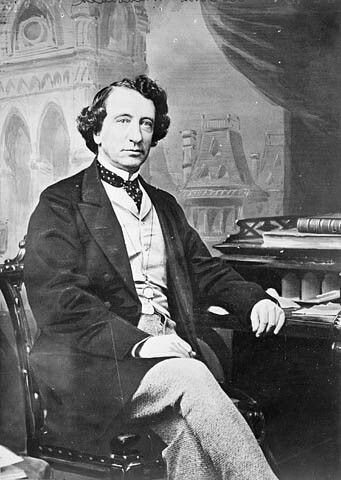 John A. Macdonald was Canada's first prime minister, and was knighted for his efforts in bringing about Confederation. His role in creating Canada, and the realization of his dream to build a transcontinental railway, have fixed his place as a nation-builder in Canadian history. John Alexander Macdonald was born at Glasgow, Scotland, the son of Hugh Macdonald and Helen Shaw. When he was five years old, the family moved to Kingston, Upper Canada. At the age of 15, he began legal studies in Kingston, and by the age of 19 opened his own law office there. He became known as a quick-witted and ingenious trial lawyer. Later, he was named solicitor for both of Kingston's banks. He was married twice, to Isabella Clark on September 1, 1843 (d. 1857), and to Susan Agnes Bernard on February 16, 1867. Macdonald was interested in public life from an early age, holding offices with a variety of boards and societies before becoming an alderman for Kingston in 1843. In 1844 he entered provincial politics as a Conservative member for Kingston, acting as receiver-general. After the defeat of the government early in 1848, Macdonald spent the time in opposition working for the interests of his party. He helped form the 1854 coalition with Upper Canadian reformers and French Canadians, creating the Liberal-Conservative Party (forerunner of today's Conservative Party.) With this coalition in power, Macdonald was appointed to the office of attorney-general. Later he acted as co-premier, first with Étienne-Paschal Taché, then with George-Étienne Cartier, between 1856 and 1862. The instability of the government during this period, and the growing opposition to the union of the two Canadas, indicated that changes needed to be made in the way the region was governed. In 1864, Macdonald accepted George Brown's proposal of a "Great Coalition" government to bring about constitutional change. That summer was spent in preparing the proposals presented at the Charlottetown Conference. At the Québec Conference, Macdonald claimed responsibility for the Québec Resolutions. After Brown's resignation in 1865, he was generally regarded as the chief architect of Confederation. He was a leading delegate at all three Confederation conferences, and was knighted for his work towards union. It was because of his role in Confederation that Macdonald was asked to be the first prime minister of the new Dominion government, a position he would hold almost continuously for the rest of his life. Macdonald's first term in office was marked by nation building. He added Manitoba, Prince Edward Island and British Columbia as provinces, and acquired the territory that would eventually become Alberta and Saskatchewan. He also began the Intercolonial Railway between Québec City and Halifax, and started planning for the Canadian Pacific Railway (CPR). Macdonald's term as prime minister was interrupted in 1873 by the Pacific Scandal. However, he was fortunate in that the scandal coincided with an economic depression, which people blamed on his Liberal successor Alexander Mackenzie. In order to rebuild the Conservative party's fortunes, Macdonald began promoting the protection of Canadian goods through high tariffs on imported items, particularly those from the United States. This so-called National Policy played to anti-American sentiment throughout Canada. It resulted in the resurrection of Macdonald's political career, and the Conservative party, in the general election of 1878. Macdonald, while defeated in Kingston, was later elected in Victoria, British Columbia and Marquette, Manitoba (he chose to represent Victoria). The early part of Macdonald's second term was marked by the construction of the CPR. During this time he was faced with a lack of funding for the railway, and a Métis uprising in 1885. After using the CPR to quickly transfer troops to the troubled area, ending the rebellion, he was able to justify further government funding for the railway's completion. The arrest and execution of Louis Riel as a result of this rebellion caused Macdonald to lose political ground with both French Catholics and English Protestants. He also faced difficulties with the Separate Schools Question, a problem eventually decided by the courts. Macdonald's final years in power were marked by ill health, and the loss of colleagues through illness or death. He was able to win the general election of 1891, and had the honour of introducing his son Hugh, elected as a member for the first time, to the House of Commons. However, Macdonald would not live long enough to witness his son's political performance, dying soon after the opening of Parliament.